Osteopetrosis: lateral radiograph of the skull reveals diffuse thickening of the calvarium, most significant in the region of the occiput. The partially visualized upper cervical vertebrae and maxilla are also dense and thickened. This is a case of osteopetrosis, also referred to as marble bone disease. In osteopetrosis, bones become abnormallly hardened, as opposed to osteoporosis where bone mineral density is abnormally decreased and osteomalacia where bones are abnormally soft. Osteopetrosis is thought to be caused by impaired osteoclast activity, resulting in impaired bone resorption and unopposed osteoblastic activity leading to abnormally dense bones. This predisposes to fractures and impairs healing of those fractures. Osteopetrosis can be autosomal recessive (1 in 250,000 people) or autosomal dominant (1 in 20,000 people), in which it is referred to as Albers-Schönberg disease. The infantile types of osteopetrosis are typically autosomal recessive and the adult types of osteopetrosis are typically autosomal dominant. The differential diagnosis for a thickened calvarium includes Pagets disease, hyperparathyroidism, metastases, fibrous dysplasia, extramedullary hematopoiesis, acromegaly, osteopetrosis and pycnodysostosis. 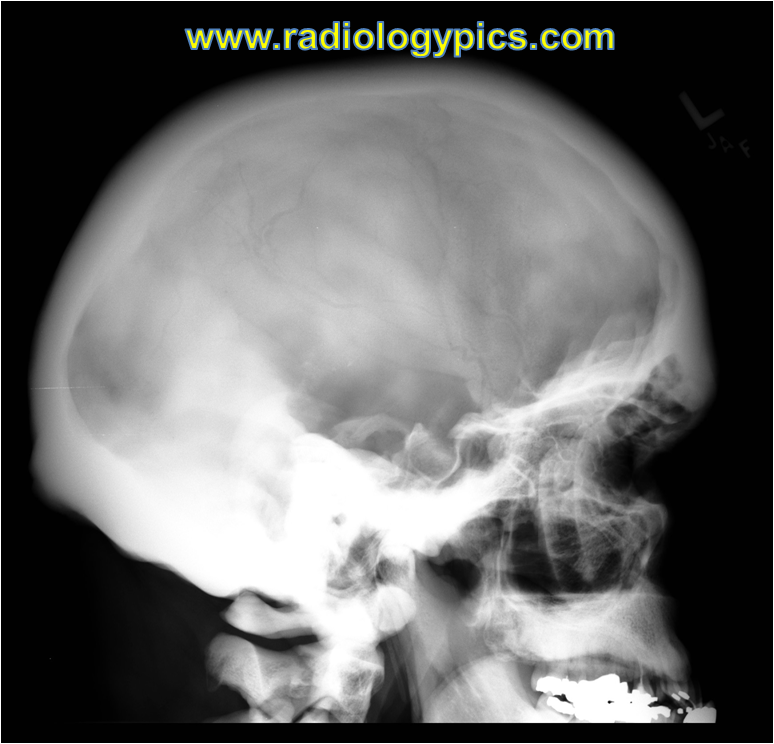 Sometimes dense skull bones can lead to hearing loss with osteopetrosis. See a case of hearing loss due to cochlear otosclerosis here. See a case of Rickets osteomalacia here.